25.08. - 06.09. 30.06. - 24.08. In the daily rate is included the weekly cleaning with changing of linen and towels, electricity, and heating. Extra Person (Extrabed): Euro 10 per day. Children until 5,99 years are free of charge, Children 6. – 14,9 years 50% discount. Baby cots are available on request free of charge. On Arrival the apartments are available after 3 p.m. and we ask you to check out until 10 a.m. at the front office. Late check out might be possible on request with surcharge and by prior arrangement only. By late arrival and late check out without notice we will charge the daily rate. Thank you for your understanding. 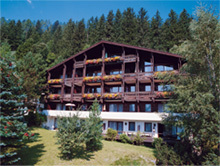 Cancellation fees on request and based on the Austrian hotel rules.